No matter how talented you are at creating something, whether it be a delicious meal, a stunning outfit or a beautiful painting, the process is always so much easier and more successful if you have the best ingredients, materials and tools to work with. As writers we are spoilt for choice with all the free information we have access to on the Internet. The problem -- especially when you dive deep into a large writing project (whether fiction of non-fiction) -- is how to organise and store all that great information that you might need someday. And then how to choose the best of it to put into your book, leaving what you don't need for another day. This is where Scrivener Writing Software excels. If you haven't come across Scrivener before, it's a writing software that is available for Mac or Windows, is very affordable (around $40), and will revolutionise how you structure and organise your writing. To show you how Scrivener works I am going to pick a fairly large and complicated project, gather information for it inside Scrivener and use my research in the writing process. I will use a hypothetical fiction example because it illustrates the point well -- but exactly the same principles apply to non-fiction. Let's say I want to write an historical adventure series set around 270 years ago, starting in Scotland, taking a detour to America, and possibly ending up in Africa or India by the time I get to book five. The first step is to open a 'project' in Scrivener and select the template for a novel. I'm choosing the novel template because it comes pre-configured with sheets for 'character' and 'place' sketches, as well as a folder containing the pages I will want in the front matter of my books when I go to compile them for export. Compile is simply Scrivener's word for formatting -- turning your draft into something you can publish -- whether that's a word document to send to your editor, or a mobi for kindle or a pdf for printing. And front matter are those pages relating to copyright, title etc. Perfect for authors who are self-publishing. Non-fiction writers can dispense with the character sketch folder, but you'll still want the front matter folders. 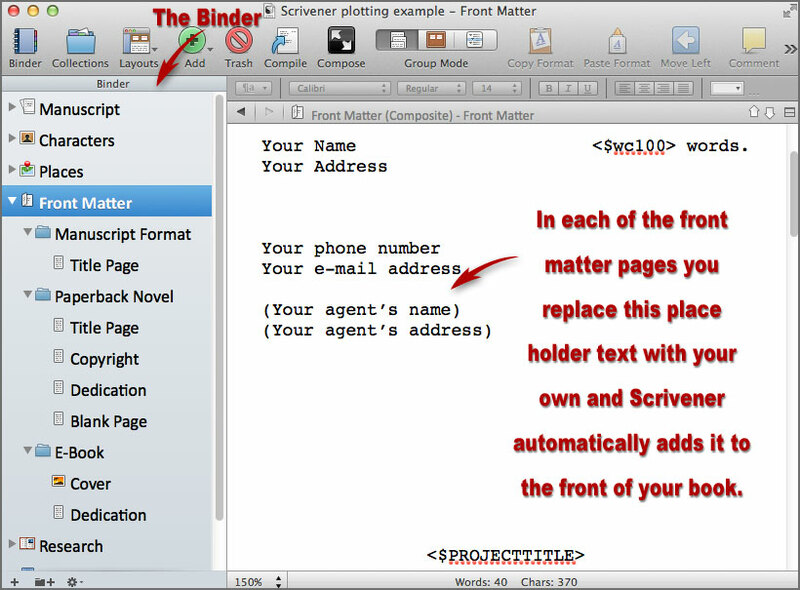 The list of folders in a Scrivener project is stored in the left hand sidebar called the Binder. I've created a project that I know is going to need a lot of research -- and I need somewhere to store them. I'm spanning the unsuccessful Jacobite uprising of 1745 in Scotland, right across to the American war of independence. Again, this is just as an example -- you'll have your own topics you want to keep notes on. To do this efficiently, I open up the 'research' folder — already in my Binder by default — and I create folders for each of these important events. Then, I create files inside each folder to sort my research into categories that I can refer to easily when I come to write by books. If you are familiar with Scrivener, you might know that you can drag links directly into the Research folder from the Internet. I prefer to paste the links inside a file, with a few lines of explanation on what they contain. Scrivener stores these as links and, if you click on them, you'll go straight to the original web page or video. More often than not, I just take an excerpt of the information I need for my project and discard the rest. Underneath the 'events' folders I like to create folders for research about dress, food, diseases and medical techniques, personal hygiene (or lack thereof), weather, and anything else that contains juicy historical detail. I might also keep references to obscure details like the model of printing press used at the time. Really, you just want to add whatever is relevant and interesting for you. And because it's all in one place you don't have to scroll between web links and word documents, and over to your explorer. Now that I have some idea of the facts -- the lifestyle of the people of the era, I start to think about my characters. Which side of the war are they on? Are they brave or cowardly? Again -- if you're writing non-fiction this might not be relevant. But it might be. 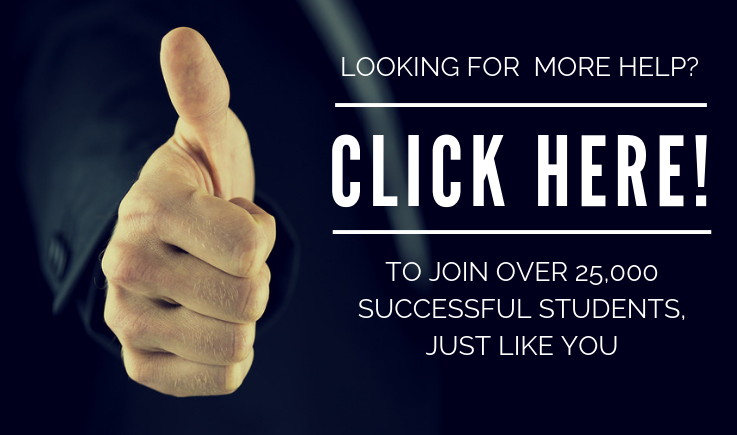 What if you want some recurring case studies throughout your text. Scrivener software is perfect for this. 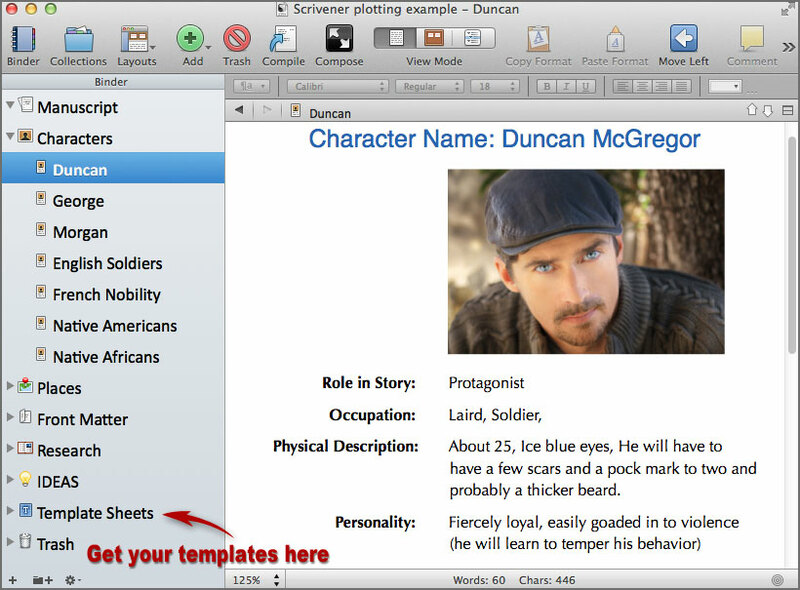 I simply make a copy of Scrivener’s preconfigured character template, title it for the character, and create a complete character sketch including backstory. (I also do this for groups that share characteristics, for instance, English soldiers, French nobility, Native Americans, Native Africans or Native Indians). And I can drop images in there as well. This is a lovely fiction technique that you can 'borrow' for non-fiction -- maybe you have some real images of your clients and customers so that you can visualise who you are writing to? Once I am happy with my setting and my main characters, I start on my plot. Bear in mind that I would already have this in outline as I move through the research phase -- in my case I like to jot down ideas as they come up in an 'Ideas' folder in the Binder. I like to plot using the corkboard feature in Scrivener. Conceptually, it works just like a real corkboard -- you have note cards and you can write summaries and move them around. 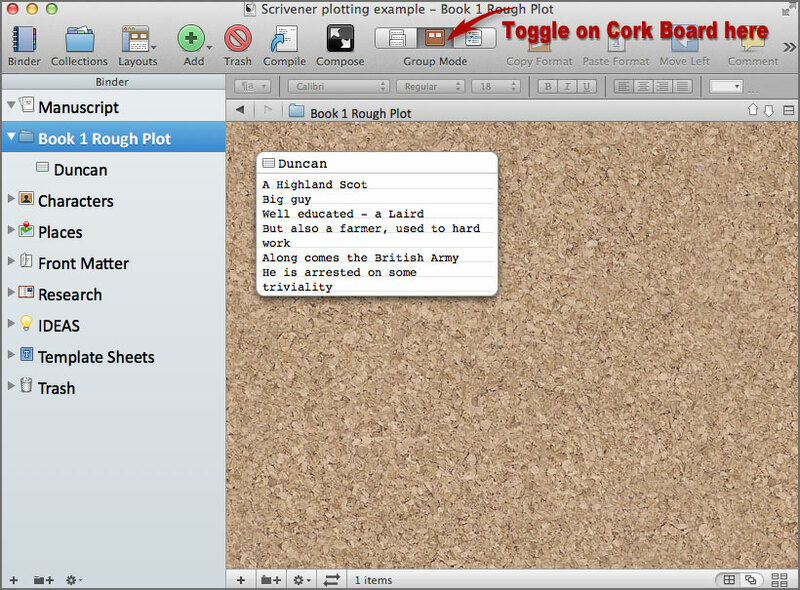 Directly below the 'Manuscript' folder, I create a Rough Plot folder for the first book, select it, and then select Cork Board view mode from the toolbar. Placing my cursor inside the corkboard I hit Enter (Return on a Mac) which brings up a virtual index card on the cork board and simultaneously opens a new document in my Binder to which that index card is attached. I give this idea a name and I write a short synopsis for it on the card. It's exactly the same process for writing your non-fiction book. You have a chapter, or a section, idea and you scribble some notes. If you're using the corkboard view the synopsis doesn't appear in the actual file, only on the card. I like to do this at scene level, and a section of a non-fiction book is a good equivalent. I might move things around and merge scenes or split them into two or more scenes later in the process. This is just my stage one. I then do the same for all my other ideas. I can rearrange my index cards on the corkboard as my plot develops simply by clicking and holding on a card and dragging it to a new position. If I move it on the corkboard its position in the Binder will update as well and if I change its title, the title of the document to which it is attached will update to match. Once I am happy with the order of my index cards, I 'split' the Scrivener screen. I leave my plot on the corkboard view, open in the top screen. I place my cursor inside the bottom screen to select it and then choose the first file of my plot from the Binder. As it's a single file, it will automatically open in normal editing view and I can begin to write the scene up using its index card as a reference. While I am writing, if I need to reference any of my research I simply click inside the top part of the screen to select it, choose the research I need from the Binder, write up what I need, and then revert to my plot cards in the top section again and move onto the next subject. All the time I am writing, I can add more research that I might need. I can also change my character traits (probably not needed for non-fiction), rearrange scenes, and so on. My Scrivener project is a dynamic tool for all the writing and research I do. Because this is a series, I also create folders with outline plots for book 2, 3, 4 and 5 -- even though they may be virtually empty for now. If I stumble upon a brilliant idea for book 4, I can come back within the same project and lay the foundations for it in book 1 or 2. Also, by the time I get to book 2, I already have all my character sketches and milieu research right at my fingertips. Once I have written the first book I change the name of its plot folder to Book 1 First Draft and go on to write the next book. I might edit it a bit, but not too closely because something big might change later in the series which may mean rewriting large sections of the first couple of books. Right at the very top of the Binder you will see a 'Manuscript' folder. This is the folder Scrivener draws the data from when compiling -- or exporting -- your book. Once I've completed a series I drag each book into the Manuscript folder separately and export it as an ebook, and also a paperback, then I drag it out of the Manuscript folder and drag the next book in to compile that for export. Really, we could write books (and there are) on the Scrivener writing software. This quick run-through of the research functions is just scratching the surface. And it's the way I like to work -- there are no hard and fast rules and you'll find your own way of organising and viewing your work. Just do what suits you best. Either way, I hope I have piqued your interest because I am convinced that whether you are writing fiction or non-fiction you can make your life much easier by adopting the Scrivener way and the Scrivener writing software to organise your writing. 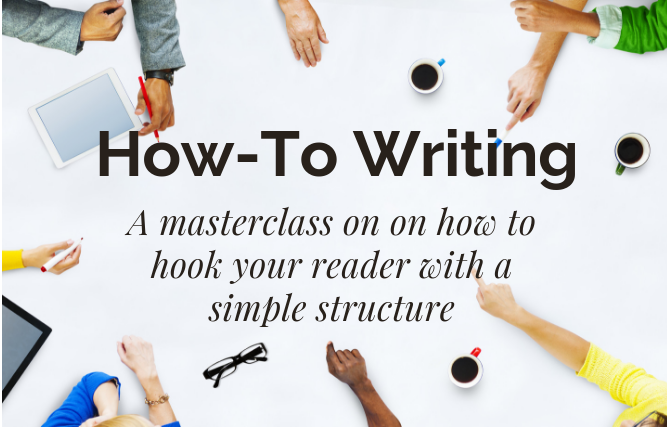 This post was written by novelist and Scrivener trainer Karen Prince. Karen teaches Scrivener | Full Course on How to Write a Book in Scrivener, the top-rated and one of the most popular Scrivener courses on Udemy.